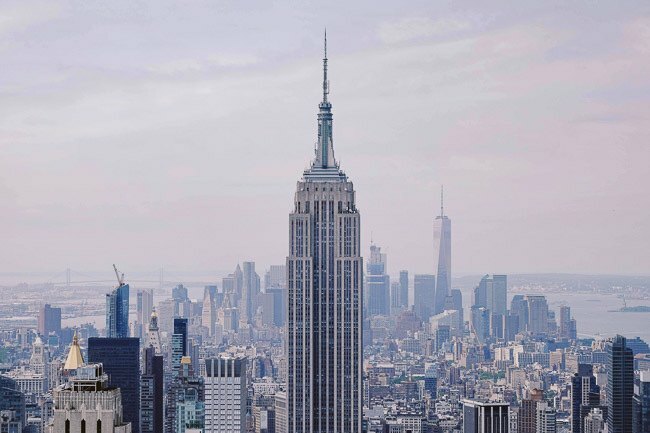 New York City hasn’t done as great a job as Boston or Philadelphia. When you walk through the streets of Lower Manhattan, signs of Colonial and Revolutionary times aren’t prominently displayed. 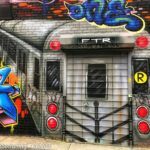 That doesn’t mean New York’s past is gone or that it can’t be found as you walk from street to street. On the contrary, you just have to know where to look. Let me go out on a limb here and ask what comes to mind when I say, Alexander Hamilton. Now, if you’re like most NYC visitors, you undoubtedly think of the hit Broadway musical. You know the one, who’s tickets are harder to come by than a rainbow with a pot of gold! But, Hamilton fans and history buffs, alike, have become curious about Alexander Hamilton’s life and story. They’ve come to New York by the bus load. What they want is to see and hear the real-life places and stories behind the man and the musical. They’ve come in search of the Founding Fathers and revolutionary war sites in New York. As a (nerdy 😉 ) teacher, I love when people are inspired to go deeper and learn more, particularly when it involves closing the books and hitting the pavement. 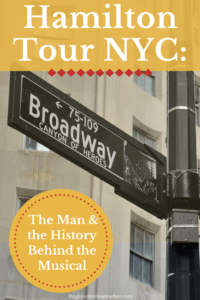 For this reason, I was thrilled to join a Context Travel NYC tour called Young, Scrappy, and Hungry: Hamilton and Revolutionary New York. Our small group of 5 people (Context tours never have more than 6.) met in downtown NYC on a bright, Saturday morning. 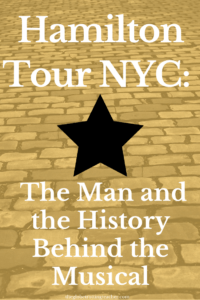 Our Hamilton Tour NYC was led by one of Context Travel‘s passionate scholars, an expert in New York Revolutionary War history studying for his Ph.D.
We started where early colonial life began in New York, which was then called New Amsterdam. 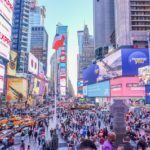 Most people, Americans included, don’t realize New York was not first settled by the English. Rather, it was the Dutch who, later on, were forced by the British to surrender their colony. 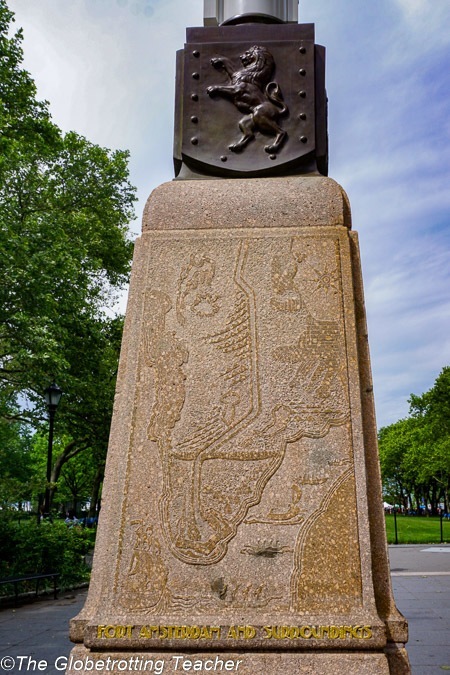 A marker in Battery Park showing the former location of Fort Amsterdam. As the tour began, we stopped in Bowling Green, New York City’s oldest park. We listened as our Context Travel Tour docent set the scene with the signing of the Declaration of Independence. When the news finally reached New York a couple days later, we heard how the King George III statue and other royal symbols in the park were disposed of by American Patriots known as the Sons of Liberty. Unlike visiting Bowling Green with just a guidebook or a Wikipedia blurb, our group had an expert who knew exactly where to direct our attention. He showed us still visible signs of the damage left behind by the Sons of Liberty. When you can actually touch history, the scene springs to life before you. It was also at this early point when I realized Context Travel Tours were not really, tours. Context walking tours are like thematic, experiential field trips. (Who doesn’t love a field trip!?) This was going to be a walking Revolutionary period history lesson, and it was so exciting to see what we would discover next. 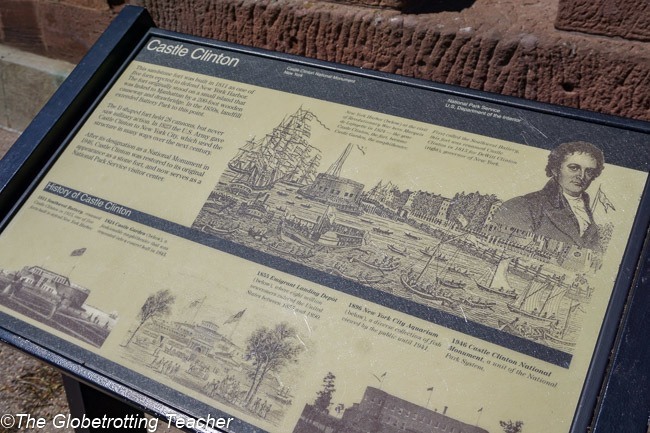 We walked, talked, and asked questions through Battery Park and into Castle Clinton. 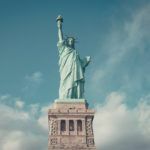 While others hurriedly moved past to board boats for the Statue of Liberty or were searching their maps for things to do in NYC, we talked about Alexander Hamilton arriving as an immigrant to New York to pursue his education. We looked out over New York Harbor and discussed its strategic positioning for both the British and the Patriots leading up to and during the Revolutionary War. 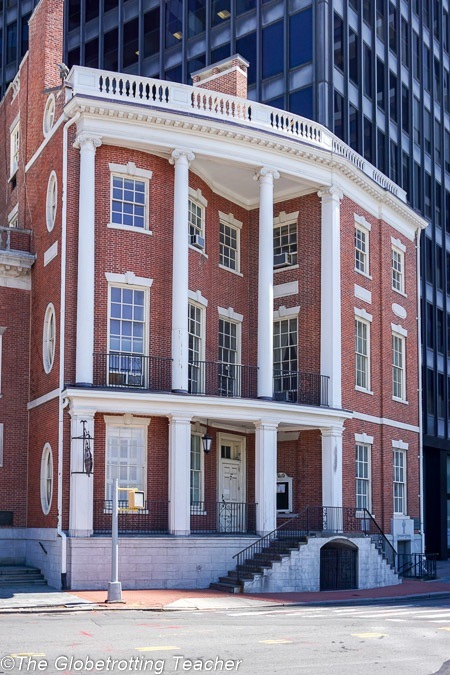 The Watson house is one of NYC’s last Federalist style buildings built in 1800 and now surrounded by skyscrapers. Our group continued by weaving its way into the oldest section of New York. On the way, we passed by the Watson House, former home to James Watson and a Federalist along with Hamilton. Lower Manhattan doesn’t have the grid street pattern as in midtown and upper Manhattan. Instead, early Dutch settlers built streets based on Native American pathways and the natural landscape of the island. This is the reason why downtown streets like Stone, Beaver, Pearl and even Broadway meander and curve. Along the way, our Context Travel docent talked about Hamilton’s role in the Revolutionary War. He joined the militia in 1775 and worked his way up the ranks. Eventually, Hamilton became a senior aid to George Washington. 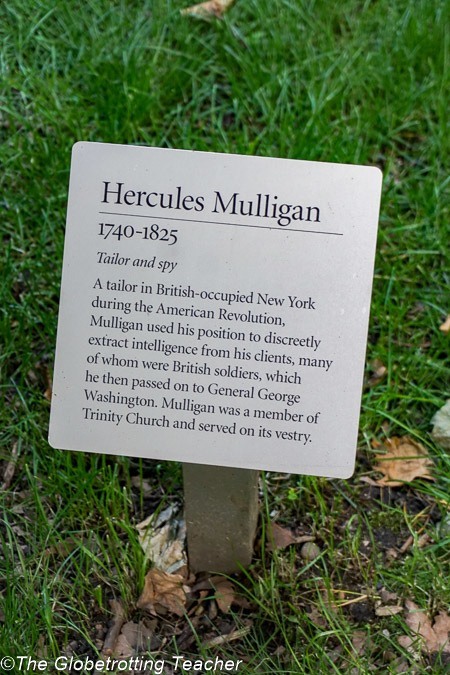 At this point of the conversation, our docent mentioned the name, Hercules Mulligan. Now, I’ve always been a history buff, but I had to admit I didn’t know much about this guy. Our expert scholar talked in detail about Mulligan’s connections to Hamilton and how he incredibly saved George Washington’s life twice. It’s at moments like these when I can’t help but wonder about all the historical information and stories still to be learned! 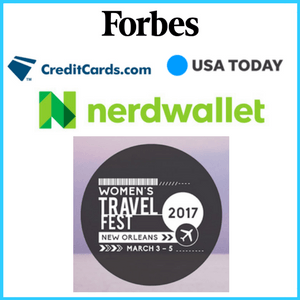 And so, fitting Context Travel’s mold as an “intellectually curious traveler,” I asked a ton of questions. I never felt as if I was holding up the group or going beyond our group leader’s expertise. Quite the contrary, in fact. My questions were welcomed and prompted others to ask their own questions for a truly in-depth conversation. 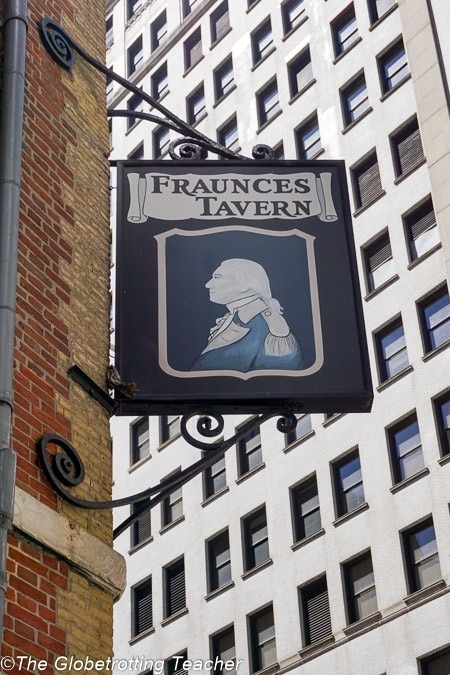 The tour continued to Revolutionary period spots like Fraunces Tavern. It was here after the Revolution where George Washington hosted a farewell dinner, thanking each of his closest military aids one-by one. 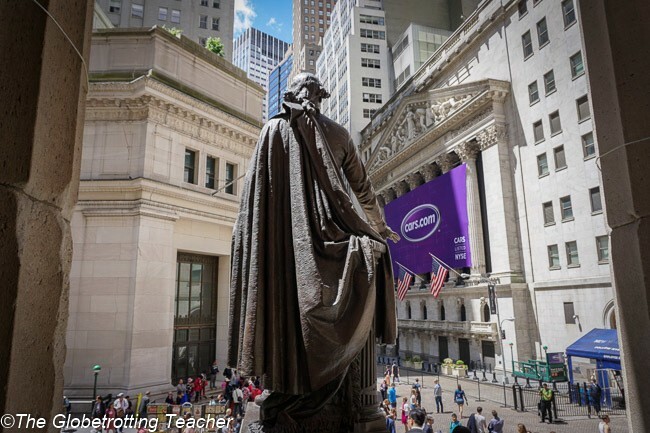 At Federal Hall, George Washington’s Statue looks out over today’s financial district. Although the original Federal Hall has since been demolished, this was the site of the first congress and where Washington was inaugurated. 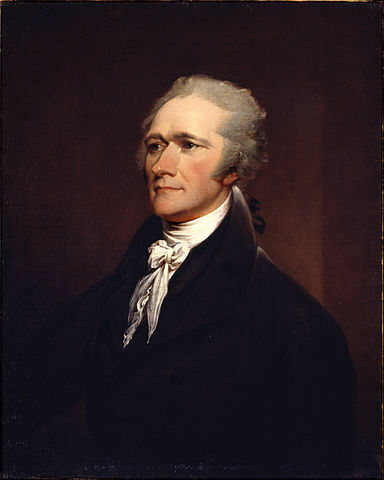 Hamilton played a key role in helping the Constitution to be ratified and became the first Secretary of the Treasury. The Federal Reserve Bank of New York, founded by Hamilton, is just a few buildings away. The sign of a great tour is one that is a walking, interactive, and in-depth discussion. Context Travel accomplished this with ease. When Context tours come to an end, you have a fuller understanding and the inspiration to go even deeper into the subject. 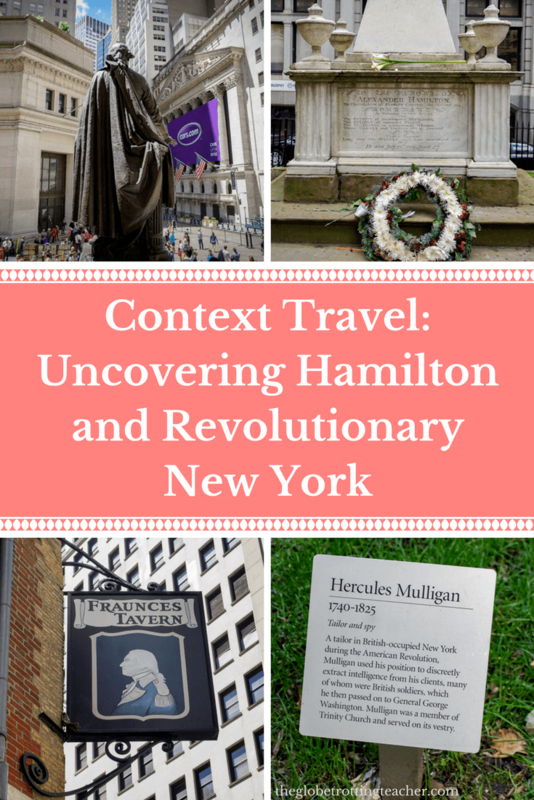 I was so interested in what I’d learned that I spent the weekend reading more about Hercules Mulligan and deciding which Alexander Hamilton books to read. 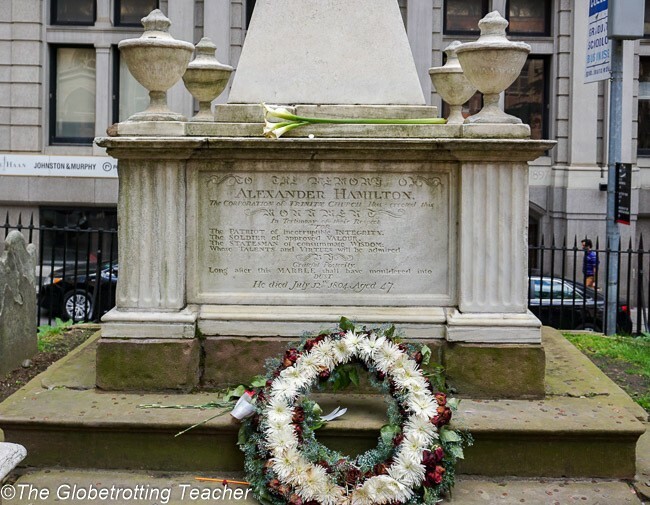 Towards the end of our Context tour, we entered Trinity Church’s cemetery to see the resting places of Alexander Hamilton, his wife, and family. Eliza’s sister, Angelica, and Hercules Mulligan were also buried nearby. Now, I’m not sure what your reason for traveling is? Maybe you’re looking to check off items on your must see and do list. Or perhaps, you’re hoping to grow in some way from your experiences? If you’re like me, you truly believe in the teaching power of travel. But, I get it. Your time as a traveler is precious. So, make certain the experiences you choose are ones that’ll stay with you long after you’re back home. If you’d like to go deeper on your next trip, check Context Travel to learn about their offerings in 40 cities around the world. 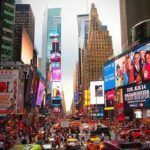 Visit Context Travel New York for more information about the tours offered in NYC. 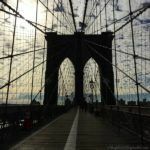 Would you like to take this Context Travel NYC tour? 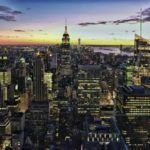 Are you interested in Alexander Hamilton and Revolutionary war sites in New York? Disclosure: I was a guest of Context Travel. 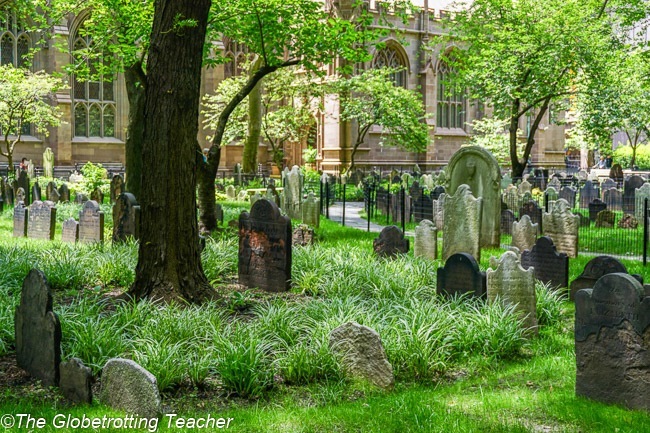 This teacher, traveler, history nerd genuinely loved learning with Context Travel New York. As always, all opinions are my own. I have been to New York quite a few times and this is the first time I’m seeing this. Definitely a different and unique tour! I really like getting to know the lesser-known sides of the history of a city/place. What I read so far about Context Travel has been very positive. Really interesting and insightful tours. Thanks, Tom. 🙂 Yes, most U.S. history books only focus on the English 13 colonies, which is such a shame. The Dutch history of NYC is so rich. Thanks for reading, Kate. We can totally nerd out together over Hercules Mulligan! He is such an interesting Revolutionary War figure. I’m not too big on cemeteries, but honestly it would be so cool to see the grave stones of Alexander Hamilton. So cool how much history NYC has—even more than I already knew! So much history, Miranda! The layers from each time period are fascinating. I know a ton about Dutch NYC but it was cool to see how Dutch sites figured into Revolutionary history. I wish I’d taken this tour when I was in NYC. You’re right, I only knew about Hamilton because of the Broadway show. I joined the onsite lottery everyday while I was there but I was never lucky. He’s such fascinating man! 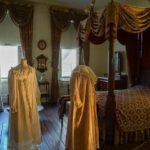 Tours with Context Travel are filled with such history and depth – like you said, thematic field trips. I’ve gone on Context Travel tours in Paris and Bangkok and have impressed. This one in New York and story of our founding fathers and nation sounds incredible. I’m all for learning and touring at the same time. Thanks for sharing this particular Context Travel tour. What an awesome guide. I definitely missed most of this on my trip to NYC. I was all caught up in the new, the big buildings and the art, that I totally didn’t even think about Revolutionary War history. I did make it to Trinity Church, which was beautiful, but my brain stopped on history there. I won’t make that mistake next time! Sounds like a really great tour – I think you’re right – I’ve been to New York so many times, but didn’t pick up on any of the sites from colonial / revolutionary times – so it’s definitely about knowing where to look. I love that Context tours never have more than 6 people on it, – makes it feel less like a tour and more like a group of friends exploring. And I love that you can ask as many questions as you want and have in depth conversations. I had no idea that New York was settled first by the Dutch – learned quite a lot of new things today! This is something I didnt imagine for New York. This is something unique and different tour. I would like to experience when I visit this city. This is really interesting, to walk back from the past and learn the history. Totally, Cai. 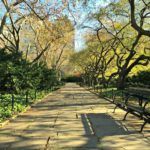 If you don’t know where to look, you walk right past and never realize how much Colonial and Revolutionary history NYC has. Hope you can visit soon! Can’t go wrong with either of those cities, Ollie. Hope you can visit soon!